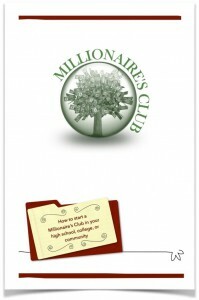 The Millionaire’s Club is a complete financial skills experience designed for delivery in a club-like setting at the high school level. In addition to the information you’ll find on this page, the Foundation has also created a focused site for all things Millionaire’s Club. Please visit MillionairesClub.Org and register to discover a trove of useful information! Clubs are provided seed grant funding, detailed curriculum, and Faculty Advisor and Club member materials at no charge. Entry into national competitions such as The Stock Market Game™ and The Personal Finance Challenge™ and additional support materials are also included in the Club curriculum to add a fun, competitive edge to the Club. Club members elect their own leadership, actively engage in the program, and conduct a year-ending entrepreneurial project that allows Club members to put into practice their new financial skills while ensuring the Club’s future. New Clubs are seeded through a grant shared equally between the Foundation and a credit union sponsorship partner or other interested party. Faculty Club Advisors are offered training and tools to help make their Club successful. By the Club’s third year of operation the members are expected to engage in an educational entrepreneurial project that instills business planning skills and generates funds to sustain the Club. Professional financial guest speakers are provided through the Club’s sponsor(s). Typical Club size is 15 to 100+ members and can be offered before, during, or after school hours. Clubs have also been formed by non-school organizations. Download a sample Club Agreement that outlines responsibilities of the Foundation, the sponsoring credit union, and the host organization. Interested in establishing a Millionaire’s Club in your school or religious or community organization? We’re here to help you get started. 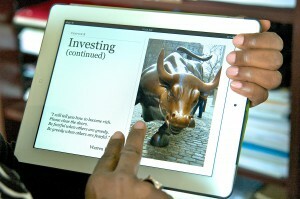 Apple iPad users can now download the free digital version of the Millionaire’s Club Advisor Guide at the iBookstore. The digital version of the Advisor Guide includes embedded presentations, links to support sites, an interactive skills assessment, glossary, and other bonus features not found in the paper version. 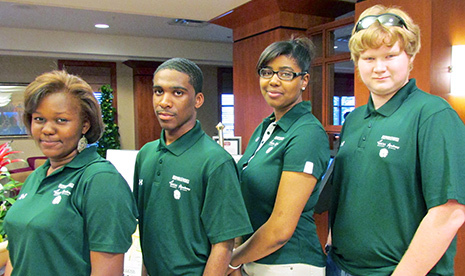 Students at a Howard County, MD high school overcame several thousand other teams across the country in a competition that demonstrated personal financial skills they’ve mastered in school. 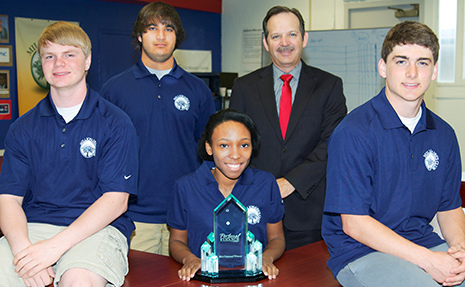 Howard County’s Applications and Research Lab, a business and technology-focused high school, outperformed 3,979 teams in a qualifying round before progressing to claim victory over 23 other teams to win in the national finals. All four members of the championship team are participants in the Millionaire’s Club, a financial education program created by the Credit Union Foundation MD|DC. The ARL Millionaire’s Club is sponsored by SECU of Maryland. The school’s national team was led by faculty Club adviser Maddy Halbach and included students Austin Adamczyk, Brooke Rankin, Johnathan Taylor and Matthew Poltorak. Austin Adamczyk serves as an intern at Howard County Education Federal Credit Union and Matthew Poltorak is a student representative on their Board of Directors. National Personal Finance Challenge Champs pose with their 2016 trophy, awarded along with a $1,000 cash prize per member. The team, all members of the SECU-sponsored Millionaire’s Club at Howard County’s Applications & Research Lab, home of the county’s Academy of Finance, bested teams from across the nation at the competition held in Kansas City, MO in May. Club Advisor Maddy Halbach is also pictured. The National Personal Finance Challenge was hosted by the Missouri Council on Economic Education at the Federal Reserve Bank in Kansas City. A month before their win in the finals, the team beat out 28 teams across Maryland to take the state title in a competition run by the Maryland Council on Economic Education. Another Millionaire’s Club team from Mt. Hebron High School in Ellicott City placed second in the State competition. 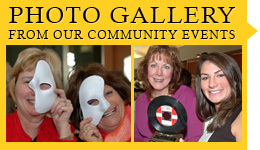 That Club is sponsored by Howard County Education FCU. Maryland’s Personal Finance Challenge, sponsored by M&T Bank. “Students who participate in the Millionaire’s Club receive a definite advantage; both in these structured competitions and throughout their lives,” noted Kyle Swisher, Executive Director of the Credit Union Foundation MD|DC, creator of the Millionaire’s Club. 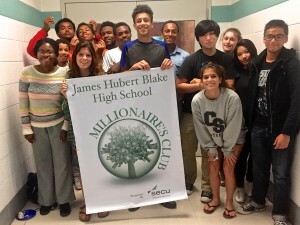 Over 1,500 students participate in the Millionaire’s Club which is active at 23 sites. The Millionaire’s Club is a financial education program currently available to schools throughout Maryland and the District of Columbia. Preparations are underway for a national expansion. For more information on the Millionaire’s Club financial freedom experience, visit cufound.org/millionaire. 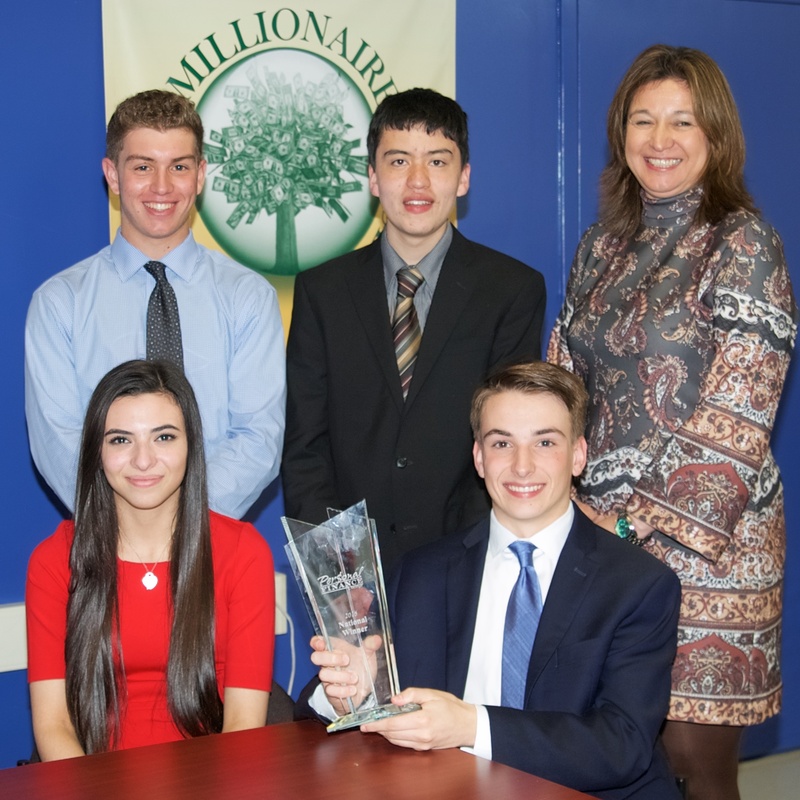 National Personal Finance Challenge Champs pose with their 2014 trophy, awarded along with a $1,000 cash prize per member. The team, all members of the SECU-sponsored Millionaire’s Club at Howard County’s Applications & Research Lab, home of the county’s Academy of Finance, bested teams from across the nation at the competition held in St. Louis, MO in April. Club mentor John Hauserman is also pictured. The Millionaire’s Club Team from the Applications and Research Laboratory (ARL), the centralized Academy of Finance facility for the Howard County Public School System, won first place in the Maryland Council on Economic Education Personal Finance Challenge State Competition on April 11, 2013. Each team member was awarded $500 and an all expense paid trip to the national competition to be held May 2, 2013 in St Louis. The winning team contestants were all members of the SECU-sponsored Millionaire’s Club at ARL. Watch Montgomery County Employees FCU launch their sponsored Millionaire’s Club at Northwest High School! Members of the River Hill High School Millionaire’s Club pose with their Faculty Club Advisor, Teresa Waters. 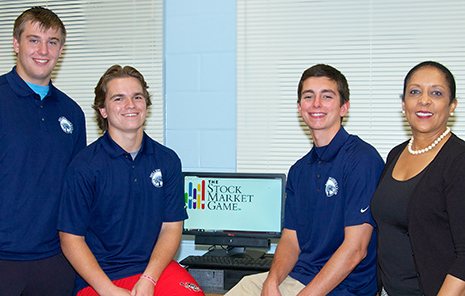 The students placed first in the Central Region’s Stock Market Game, a nationwide investment simulation that challenges student teams to invest $100,000 in virtual funds in stocks. The teams research, invest, track, and trade their stock picks. The Foundation’s Millionaire’s Club financial literacy program helps high school teams prepare and compete in the fall and spring sessions. 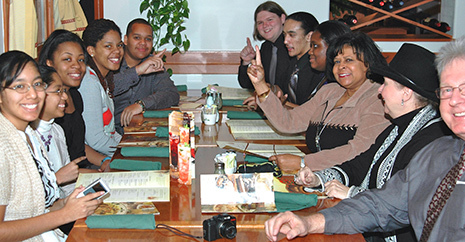 Members of Frederick Douglass High School’s Millionaire’s Club in Upper Marlboro, MD, gathered to celebrate their first-place finish in the 2012 regional Stock Market Game and fourth place statewide. The after-school financial literacy club, created by the Credit Union Foundation of MD & DC, competed among 1,148 teams in Maryland and 136 teams regionally to earn their top spot with a 22.64% return above the S&P 500 Growth Index over a three-month period. Educational Systems FCU who provides on-going support for the Millionaire’s Club, sponsored the victory dinner which was also attended by school and county administrators.